Hurricane Sandy did so much damage that her name has been retired. Hurricane Sandy delivered a historic level of destruction to the Eastern Seaboard, doing so much damage that it has achieved the ignominious distinction of having its name retired. "If a storm is so deadly or so costly that the future use of the name would be insensitive, or even confusing, then that's the criteria," said Dennis Feltgen, spokesman for the National Hurricane Center. "Certainly, the impact that Sandy had, not only in the United States, but also Jamaica and Cuba, where it made landfall as major hurricane, it's almost a no-brainer that Sandy would be retired." 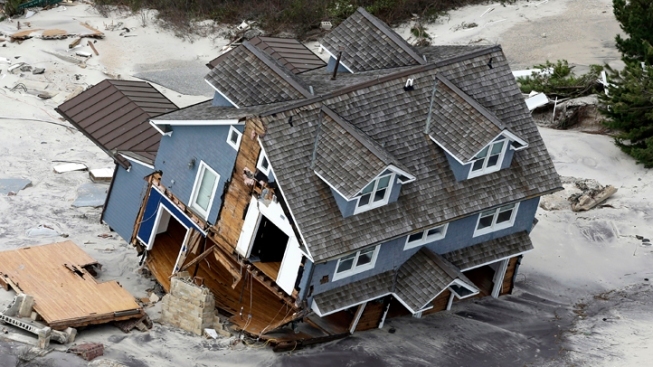 Preliminary estimates say that Sandy, which made shore Oct. 29 in New Jersey, cost Americans more than $50 billion and 147 lives. At the most recent meeting of the World Meteorological Association's hurricane committee, it was agreed that "Sandy" would be the 77th name to be retired from use since 1954. Because names are assigned to storms alphabetically and reused every six years, when one name is retired, it must be replaced by another name with the same first letter. Taking the place of "Sandy" will be the name "Sara." Since 1995, there have been 39 storm names retired, a rate more than double what we saw in the '70s and '80s. Feltgen says the jump is due to a surge in hurricane activity, but that's not the only reason there have been so many names retired of late. "It's not that the storms are any more intense, they're not. We're throwing more people and real estate in harms way," said Feltgen. Quite simply, the build up of property and communities along the shore has put more lives and dollars the path of storms. According to Feltgen, cycles of increased hurricane activity can last as long as 40 years, so he says it's reasonable to assume that the one we're in now is far from over. And even we do return to a lull in storm activity, there's still no shortage of danger. "Just because you're in an inactivity period doesn't mean you won't get clobbered. A great example is Andrew in 1992, that was still in a period of small hurricane numbers, but that was the last Cat 5 to hit the U.S."